Elk Lake Premier home, private waterfront, close to Traverse City! 4 bed/2.5 bath, 2 car garage, private 100 ft lakefront w/ dock, 3 Kayaks ! Travelers:June/July/August - 7 day Sunday to Sunday rental schedule. 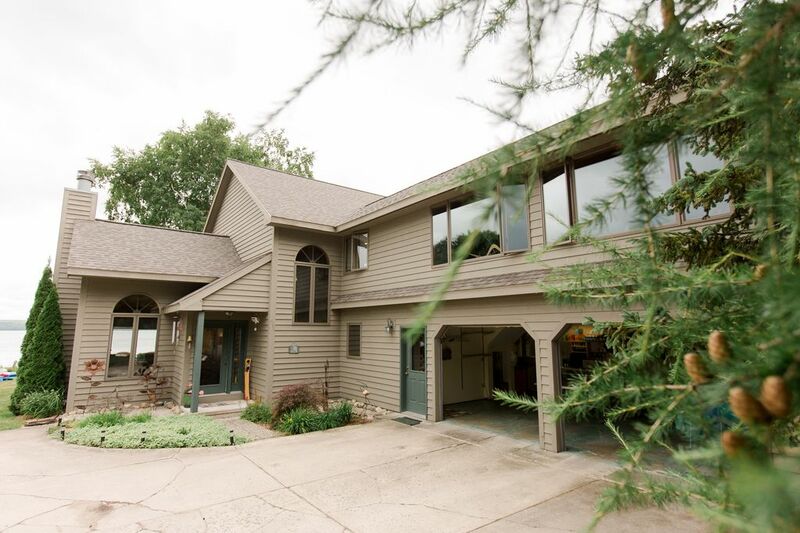 This lovely 4 bedroom contemporary style home not only offers stunning views from sunrise to sunset, it is conveniently located 10 minutes from Flintfield Horse Park, Turtle Creek Casino, and the charming village of Elk Rapids. It is 20 minutes from downtown Traverse City and Cherry Capital Airport. A mile north of Whitewater Township public boat launch, this jewel can be your starting point for water tours of the Chain of Lakes, including easy access to Torch Lake, multiple sand bars, and the villages of Alden and Elk Rapids. This property includes dock and mooring, along with 3 kayaks for guest use. Elk Lake is great for swimming, snorkeling, fishing, and the lake bottom is sandy off the dock with small stones along the shoreline. A multi-tiered deck runs the entire width of the home with plenty of room and furniture for grilling, dining, and lounging. Produce the perfect smore at your campfire in the waterside fire pit. Fireside chairs provided! Wood and tile flooring throughout this home provide an elegant yet comfortable feel. Granite counter tops, stainless appliances, and stone fireplaces are among the interior highlights. Lake views from every room except the guest bath and main floor half bath. Large bonus/game room is in addition to the two main floor living room areas, large kitchen, dining room, and office. We hope you enjoy our home as much as we do ! * NOTICE TO GUESTS: This property rents Sunday to Sunday peak season: June, July, August. If calendar is still open in peak season, we may consider 4 night minimum stays. Jet skis shown in photo are not included. **This home is available for a 9 month lease from September through May - contact Property Manager for details. Grand Traverse Resort & Spa- features hotel , restaurants, gallery shops, 3 Golf courses. Tennis courts, pool, access to Turtle Creek Casino and downtown Traverse City. This property is at least 6 miles from the nearest town. Village of Elk Rapids is 6 miles north. Lake Michigan and Elk Lake boat launches available. Destination restaurants, historic cinema, quaint library, Marina, Walk of Art Sculpture Park, Golf Course. At your doorstep on Elk Lake! Grand Traverse Bay- East and West arms are within 8 miles going south west.Heading north, 8 miles to Elk Rapids, Veterans Memorial Park beach on Lake Michigan. 100 ft of private frontage on Elk Lake, Williamsburg, MI once you step off the 50 ft attached deck to the gardens surrounding the water. Dock and mooring will be provided. Grand Traverse Region offers a wide variety of entertainment from theater, concerts, National Cherry Festival with 2 Parades the first week of July to the renowned TC Film Festival the last week of July. The west coast showcases the Sleeping Bear Dunes National Park located on the western shores of Lake Michigan in the rolling hills of Leelanau County. Abundant with galleries, shopping, wineries, Fish Town in Leland and pristine beaches. Old Mission Peninsula stretches out from the center of downtown Traverse City for 18 miles to host more wineries, shoreline and hill top views, the historic Old Mission Lighthouse Park at the most northern end. Plenty of restaurants on your regional sightseeing adventure from brewery fare, food trucks, coffee shops, fast food, and fine dining which is typically quite casual in this region. Take in a baseball game with the Traverse City Beachbums or a concert at Interlochen Arts Academy. A same day excursion to Michigan's Mackinac Island State Park by ferry from Mackinac City is under 100 miles or a 2 hour drive. Only bikes, horses, and walking gets you around the island of this beautiful historic village, the Grand Hotel, and Fort Mackinac. Founded in 1780, it is easy to access for touring. Petoskey, Charlevoix, Frankfurt, Suttons Bay, Northport are all great day trip locations from Suncrest South on Elk Lake!! !